I started playing Netball recently, I'm not that bad at it despite never having played before in my life (even at school!) and it's made me realise how much I like team sports and group activities (running and weight training tends to be a rather solitary endeavour)! Unfortunately, my ankle couldn't take it - I'd injured it snowboarding, probably from being a silly arse and wearing boots that were two sizes too big... my already narrow feet and stupidly teeny ankles couldn't take the movement and I damaged all the ligaments. Idiot. I finally got myself down to my physiotherapy practice - Balance, in Clapham, South London (30 seconds walk from North Clapham tube station). Balance is a fabulous place, if you want the best in injury care and rehab then head there. However, they're not just an injury clinic! They believe in the power of prevention as much as the cure so they have excellent coaches and state of the art equipment (seriously, they even have an anti-gravity treadmill!!!) to get you fitter and stronger. Balance is far more than one of the top London physio, sport injury, and spinal pain clinics. Located in Clapham London, Balance Performance Physiotherapy has drawn together a team of talented, innovative professionals with the best of credentials. Whether you are looking to overcome injuries, abolish pain, recover from surgery or attain optimal health Balance physio will move you closer to your potential and the highest possible level of function and performance you can attain. From sports physiotherapists to dieticians, strength & conditioning coaches to back pain specialists and podiatrists our multidisciplinary team work together to provide an unparalleled wealth of experience and depth of knowledge accessible to all our clients at our highly regarded and ever-evolving centre of excellence. Anyway, when I first took myself back to Balance I saw Graham Anderson who is the top guy there, head honcho. He's great, really knows his stuff and is super positive - just what you need! I explained to him what I think went wrong and where the pain is and how I can't wear high heels, at all, without being in excruciating pain from the outset (after walking for a bit it's more bearable but this is less-than-ideal huh?!) - basically I can't stand on tip-toes on my right foot, how rubbish! He strapped up my ankle and miraculously I was able to stand right up on tip-toes without hurting - at all! Basically, the muscles and ligaments which support my ankle have become weakened and stretched so they offer no support of the joint. 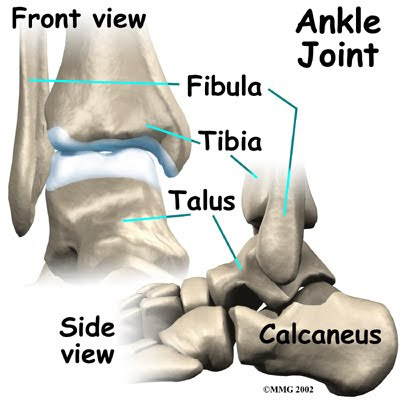 On manipulating my ankle, Graham was able to move my talus bone right underneath the tibia... it moved quite substantially, I felt it crunch, it shouldn't, I felt sick to my stomach!! There is history of both arthritis and osteoporosis in my family so this is extremely worrying and if I don't do something to attend to this I could wind up with arthritis, or worse still, osteoarthritis of the ankle! It's not all negative though, Graham says that the muscles in my calf that support the ankle act as guy ropes to prevent unwanted movement - I strengthen these and in effect I'll be doing the same job that the tape does with holding my ankle in place. To do this I have to perform quite subtle exercises mainly focused on balance to 'reactivate' the muscles that were 'switched off' when I damaged my ankle snowboarding. The week after I went to see Graham he wasn't around as he was looking after a team of tennis players (more ankle issues no doubt!) so I saw his colleague, Siân Macrae and she gave me some fabulous exercises to do utilising a stability ball, BOSU, treadmill and mat. They're great but the problem is that my ankle hurts when I perform them, so at the moment it's a fine balancing act between carrying out the exercises but not the point that it hurts. However, they have to be done, if I don't strengthen these muscles the only other option is to have my ankle pinned, which I don't want! So I will persevere, and let you know I get on, wish me luck! Lol! I need to keep my fingernails short for climbing and I'm pretty rubbish at doing girly things like painting them as I always forget to take it off again and it grows out and looks naff! !